I’ll be off to our summer trip in a bit…our first trip (well, first requiring a plane ride) as a family. We’ll be going to Iloilo, a province to the south of us where I have some family. From there we’ll be taking a small boat to the island of Guimaras where we will do our best efforts to “get back to nature” with the help of a private cove, tents for sleeping, and nights-only electricity. These tired city folk are very excited at the prospect of sitting amongst the famed triumvirate of tropical life – sun, sea, and sand. But that’s not the only thing we are looking forward to…Guimaras is famed for having the best mangoes in the country, in a country that defiantly claims to have the best mangoes in the world. Paradise here we come! We will be there for about a week so I thought I’d leave you another summer breakfast before I go. And because they are just so in their prime now, and because I will soon be in the (is)land of the best of them, it’s a breakfast that (once again) includes mangoes. I hope you don’t mind. – Slice the banana in a bowl. 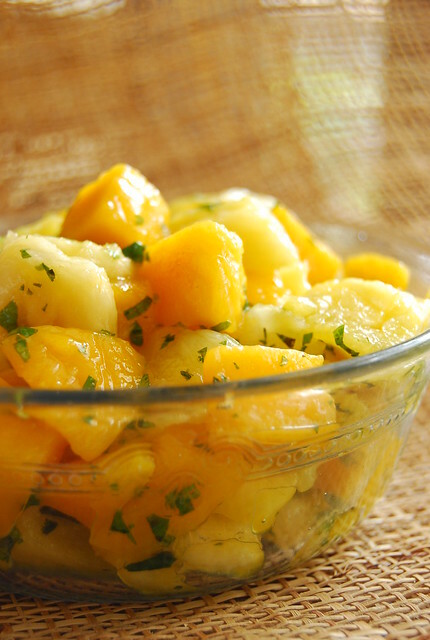 – Cut as much of the meaty cheeks off the mango. Score the flesh in a crisscross pattern. Scoop the flesh out directly over the bowl so all the juice drips into it. – Toss in the pineapple with any juice that gathered while tearing. – Add the mint and toss gently so as not to mush the fruit. – Chill for about 30 minutes. This is perfect to have during summer mornings, when you really want something cool, light, and brightly flavored to start your day. I used my own summer fruits here so feel free to substitute with your own. I love mint in a fruit salad and feel that it adds a lovely refreshing note. I don’t add any sweeteners to this because the fruit in itself is sweet enough. You can serve this as is or with a dollop of Greek yogurt. I’d better go now and make sure our first aid kit is in order and mosquito repellants packed. Travelling with a little one is a whole different circus. Little C’s bag is bigger than any of ours! A gorgeous salad! So refreshing and divine. I'll try to do this on Easter Sunday 🙂 Yumm! The trip sounds very action packed, with nature and everything. That's a happy looking salad! my mother loves making fruit salads. She usually puts watermelon, pineapple, strawberries, grapes, and cantaloupe in a bowl and mixes it all up. She, too, does not put any extra sweeteners on top because then it's just an overload on your taste buds! What i personally like to do though if you're looking for another kick of flavor, add some sherbet into the mix or on top. Orange, Raspberry, or lemon will do! Makes for a delicious, healthy treat for anyone. Looks beautiful and delicious! Thanks for sharing! Lovely salad, Joey – so sweet and colorful! I need a summer trip!! Jealous. Wishing you lots of fun and relaxing!! I Cat, it is true that Guimaras produces the best mangoes in the world. They won't even allow you (as a visitor) to bring mangoes IN the island for fear of "contaminating" their produce. Okay, I did grow up in Iloilo, I may be a little biased but hey Guimaras mangoes are really heavenly. This just looks wonderful. Mango is my favorite fruit in the whole world and my grandma used to fill the floor of the spare room with it whenever I would come home for summer and it would ripen in rows. I would eat mangoes day and night for dessert the entire summer! Thanks Anh! It was fantastic! Now getting back to the grind is what’s a bit difficult! Hi Shaina! Fruit salad with sherbet sounds absolutely perfect for this heat we are experiencing now! Thanks Ash! It was a lovely trip and we all enjoyed ourselves…especially the little one 🙂 Now it’s back to work! Hi Cat! The Guimaras mangoes are amazing indeed! Love the salad and have fun on your trip! Thanks Junglefrog! We had a wonderful time! We made these last night and immediately became obsessed. great!